This article is the continuation of our Beginners Guide to Web Scraping Series. Let’s build a very basic web scraper using Python and BeautifulSoup and scrape the top links from Reddit.com. Send a request to https://old.reddit.com/top/ and download the HTML Content of the page. This scraper does not need a web crawling component as we are only extracting data from a single link. In later posts of this series, we show you how to build more complex scrapers that need web crawlers. We will use Python’s built-in URL handling library – urllib to download the HTML of the web page. Parse the downloaded data using an HTML Parser to extract some data. ( The scraper’s parser module ). For parsing the HTML, we will use BeautifulSoup 4, a library used for pulling data out of HTML and XML files. It works with HTML parsers to provide idiomatic ways of navigating, searching and modifying the parse tree. For this tutorial, we will use Beautifulsoup along with Python’s own HTML Parser library. Transform the data into a usable format – The data transformation and cleaning module of this scraper. We don’t need any special packages to transform data in this scraper. Print the extracted data into the terminal ( or console ) and also save the data to a JSON file (our Data Serialisation and Storage Module). We will use python’s inbuilt JSON library to serialize the data into JSON and write it into a file. You have all the libraries required to build and run the scraper now. If you look closely at the GIF above, there is DIV tag, with its attribute called ‘id’ as ‘siteTable.’ This DIV encloses the data we need to extract. Now that we know where the data is present in the HTML, let’s get into extracting it. If your computer has multiple versions of python, you can do python3 reddit_scraper.py to make sure it runs using python3 and not python2. Lets first import the libraries we need – urllib, beautifulsoup, and JSON. The HTML of the URL is in the variable called html. Let’s pass the HTML Content to BeautifulSoup and construct a tree for us to parse. Beautiful soup can use different parsers like LXML, html.parser. For now, we will use Python’s built-in HTML Parser – ‘html.parser’. First, we will isolate the <div> called siteTable into a variable – main_table as we are not interested in extracting the other links from Reddit. Next, we will find all the tags inside it that contains a CSS class name – ‘title’. #pass the HTML to Beautifulsoup. #Now we go into main_table and get every a element in it which has a class "title"
We’ll go through each link we found and extract the text and the URL from them. Here is how the extracted records look now. If you look at some of the URLs above , they start with /r/pics/comments/7shgzt/the_wife_and_i_went_to_the_grand_canyon_this/. They are relative URLs, which are invalid if you paste them into a browser. We have to do some “cleaning” here. Let’s prepend https://www.reddit.com with the relative URL. But there are also absolute URLs in them, like this one https://i.imgur.com/HPJ7eq7.jpg. We only need to prepend if the link is relative. Let’s go through each URL and check if they are absolute. For now, we’ll just check if it starts with HTTP. There are better ways to check if a URL is absolute in Python. For sake of simplicity, we’ll just stick to .startwith method of a string in python. Let’s modify the code block above to add the cleaning process. # You can join urls better using urlparse library of python. They are clean, and the URLs are valid now. Let’s use a JSON serializer and save this data into a JSON file. The code below creates and opens a file called data.json and writes the data into it. That’s it. Here is the full code of the scraper. We have made some minor changes to the code, find them – they aren’t that hard to spot. #Lets write these to a JSON file for now. You should see a file called data.json in the same folder as the code, with the extracted data, if everything went right. 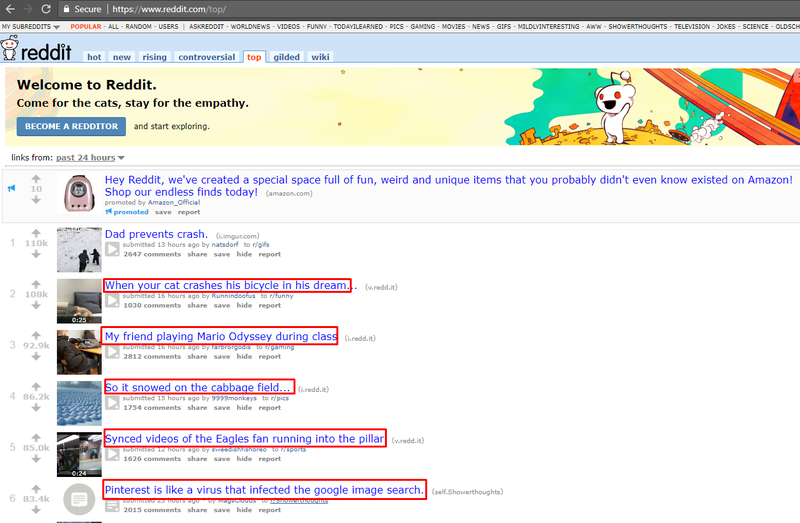 That’s it – you have built a web scraper to get data from Reddit. Yes, its a very simple scraper, but good enough to demonstrate the basics of data scraping. In next the post of this series, we will continue working on this scraper by going one page further into the comments page and extract more details like the number of upvotes, the number of comments and some top level comments. You can view the third part of Web Scraping – Beginners Guide in the post – Web Scraping Tutorial for Beginners – Part 3 – Navigating and Extracting Data. Web scraping using Python in Windows can be tough. In this tutorial follow the steps to setup python 3 and python packages on your Windows 10 computer for web scraping in Windows 10. Mark, Thank you for the feedback. div> called siteTable” and so forth no longer exist on reddit but does on old.reddit. Besides that consistently getting “urllib.error.HTTPError: HTTP Error 429: Too Many Requests” which after some google I understand is an issue with not having a custom user-agent, not addressed here. I merely copy/pasted your code above, before you added the cleaning. Any idea what is going wrong here? I am using Python 3.6.5 on Ubuntu 18.04.1. You did not put the coma before your ‘url’. Hi, thank you for this tutorial. I previously tried to post a comment with a question, doesn’t look like it went through but it turned out to be a missing comma problem..
Any idea why this is happening and/or how to fix it? how do you scrape multiple pages into a large pandas dataframe? It’s not giving expected output.